The EcoShred 320Si Packaging Shredder is the perfect machine for users to reduce the dangerous use of plastics, at the same time as encouraging the recycling of paper and cardboard. This in turn results in much less waste ending up at landfill. The EcoShred 320Si is a mid-range packaging shredder which can easily pay for its self in under a year by recycling existing cardboard into very handy packing sheets. You can expect a great reduction in costly bubble wrap or plastic chips and air fill, and at the same time will reduce the number of skips you hire. With a host of user-friendly features, the EcoShred 320Si Packing shredder can produce 3 types of packaging matting; it can shred ‘full scrunch’, ‘semi scrunch’, or ‘flat pack’ sheets by simply attaching suitable springs on the exit flap. Along with the extremely hard-wearing steel cutting head, the unit also incorporates a handy, separate cardboard cutting system. In a single pass the machine simultaneously cuts and processes the cardboard matts, as well as trimming the remaining board to a given size – perfect for your individual items. The EcoShred 320Si Cardboard Carton Shredder features a connection for a vacuum dust extraction system (sold separately) that reduces dust when used in dust-sensitive working environments and cuts down on some maintenance requirements. This single-phase unit plugs into a standard 13amp plug socket, shreds up to 3-ply cardboard layers per pass up to 320mm wide and up to 15mm thick at a rate of over 12 metres per minute. This makes flexible lattice matting which can then be used to void-fill or product protect a host of items on demand. The EcoShred 320Si produces over 2.5 cubic feet per hour of void-fill, with a recommended maximum run time of up to 6 hours, and a footprint less than 0.5sq.m. The Ecoshred 320Si Packaging Shredder is one of the safest, cleanest and quietest cardboard shredders on the market. It is CE/EMC compliant and built to class IE3 energy efficiency, which is up to 30% more efficient, using less electricity for the same performance. 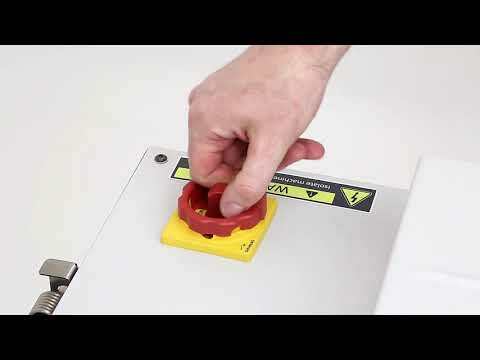 Please note that whilst machines will shred standard sized staples, it is recommended that users remove them where possible as staples and clips increase wear and tear on the cutting head and therefore shorten the machines lifespan. Furthermore most users will want to remove staples, as when used with packaging materials, shredded staples will scratch goods. The Ecoshred 320Si is supplied with a manufacturer’s 2 year return to base warranty and is available with a leasing option to spread the cost of the purchase. Extended warranties and preventative maintenance contracts (recommended) can be purchased as optional extras.